I know I promised that I'm going to stay for a while in my last post (also I'm really sorry I linked the Slovenian store ličila.si with a wrong link, I really don't know what I was thinking, but I fixed it now), but I didn't, so today I give you no promises, but a quick explanation. I had a lot on my mind, because I was feeling like I'm the worst person on the world because of my addiction, also something was really wrong with my exams and in my personal life. There is ALWAYS something and I haet that. I wish I had at least 2 peaceful months, but I guess everybody wants that not only me =). I could go on and on, explaining everything in details, but I won't because I don't want you to be reading things about my messy life. I can only tell you what made me come back. It was you! I missed you all, your lovely blogs, comments, nails: everything =). I said to myself: Dolores, you have 655 readers on line, do you really want to throw that away? Of course the answer was yes( sorry, I meant no *silly*). I do have loads of material, so I don't know how often will I post, but if I post more than once a day, I do hope you won't accuse me of spamming =). I also decided since, blogging was taking me a lot of time, that I won't write a lot, but only a brief description of my manicures =). So now I can finally go on to my manicure. This was the manicure I wanted to show you next, but this next turned out to be a whole month. 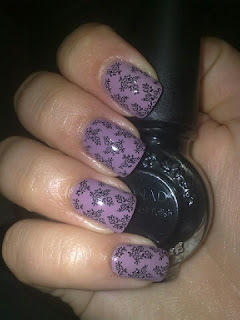 For this manicure I used purple nail polish from beautyUK urban girl set, konad black and koand plate m71. This pattern was on my WL for ages and when I got is as a preset I alsmost cried out of joy( let's keep the details until the next post). Welcome back! I'm looking forward to see all your creations. So pretty! Love that pattern. Love this mani! Reminds me of lace :) welcOme back!